2. Are filling. Everyone wants a big breakfast in this house. 3. Are preservative free (as much as possible.) We avoid canned food products like spam, corned beef, Vienna sausages, etc. But admittedly we haven’t quite quit the bacon or the boxed pancakes. Any good recommendations?! 4. Are easy enough for our househelp to replicate. 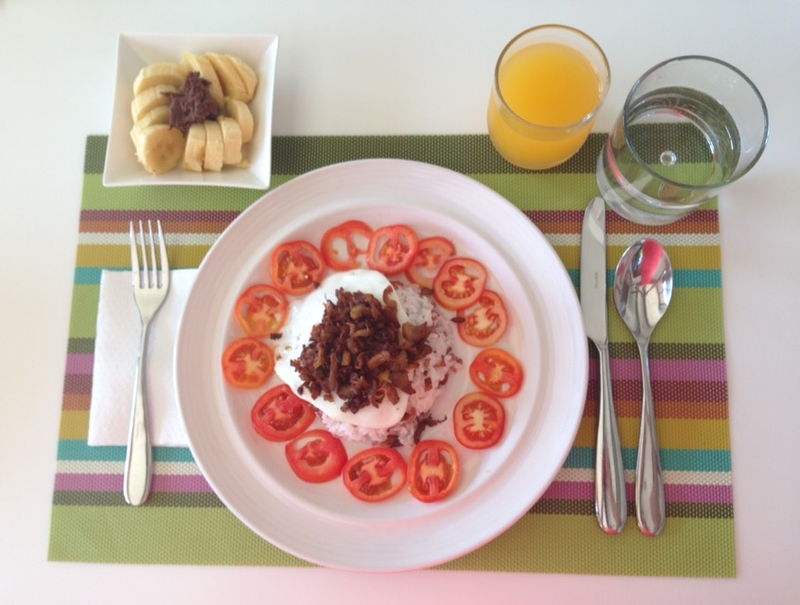 Here are our family’s top picks for breakfast meals, in no special order. And, I keep adding to these options: Pancakes and bacon. We use honey instead of syrup. It’s a little easier on the nutritional conscience. Tapa and egg. I got a great recipe from my mother in law for this tapa! SM Hypermart also sells inexpensive Rib-eye sukiyaki cut which I get for this recipe. 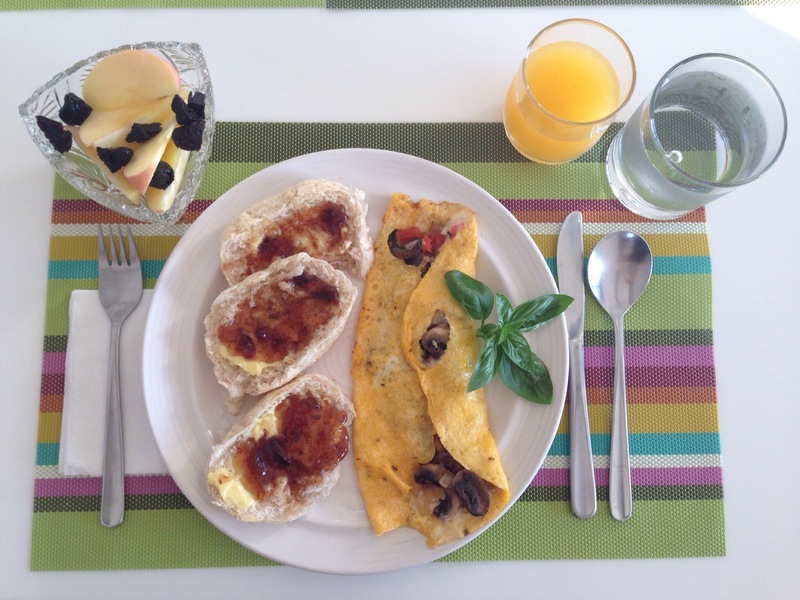 Mushroom, tomato, and cheese omelette with basil from our plant. It’s always hard for me to pull leaves off our herbs. I feel sad! We get our pandesal freshly made from our village. As you can see, I am generous with butter, for as long as it is butter and not margarine. This is always a winner for my kids. Connie’s Kitchen’s Tuyo. Edric likes Gustazo’s Tuyo. For as long as it’s tuyo, my kids gobble this up! Oatmeal (not the quick cooking kind, but the rolled oats and preferably GMO-free when I can find it in Rustan’s Fresh.) Edric and Elijah also love Brie cheese, served here with nuts and prunes. This is the only canned product we really eat. Century Tuna’s hot and spicy version and solid in vegetable oil. We cook both versions together with onions and the kids devour it. Titus likes his bagels! We put lots of cream cheese on ours and top it with strawberry jam. On the upper left is a bowl of granola with yoghurt and fruit. Adobo flakes on fried egg on rice. If we have adobo the night before, we make adobo flakes the next day. Yummy! On the top left is banana with Nutella. This is Tiana’s all-time favorite way to eat bananas. 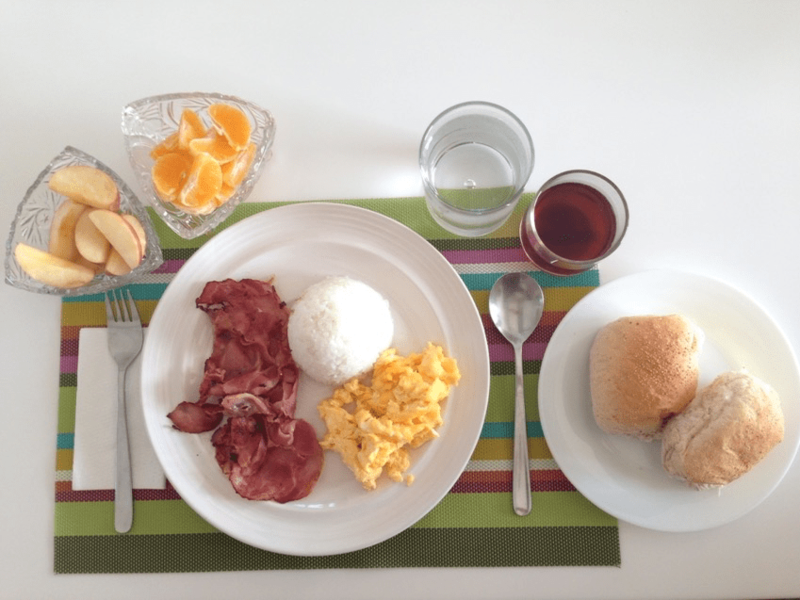 Ideally, the food should be presented the same way so I took these photos to print out for our househelp’s reference. 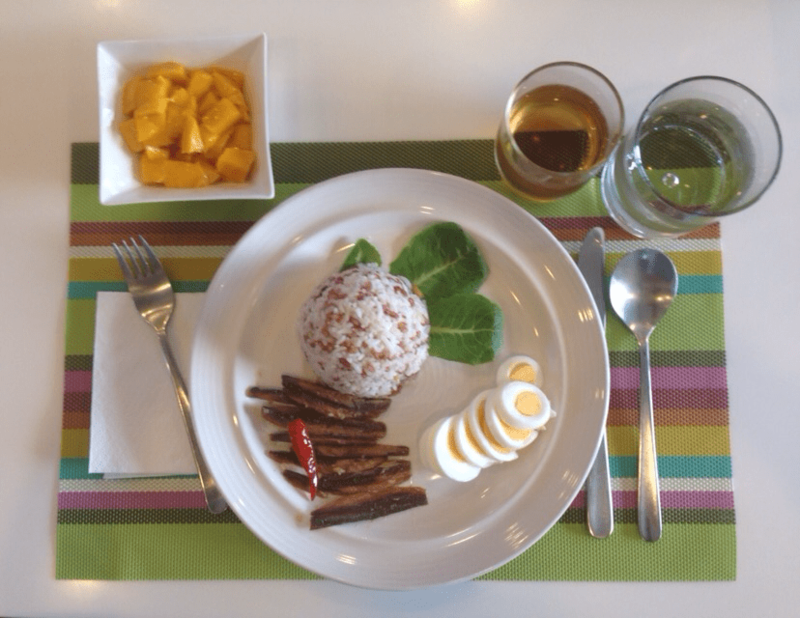 – Spicy sardines (we like the San Marino brand) and fried egg, and pandesal. 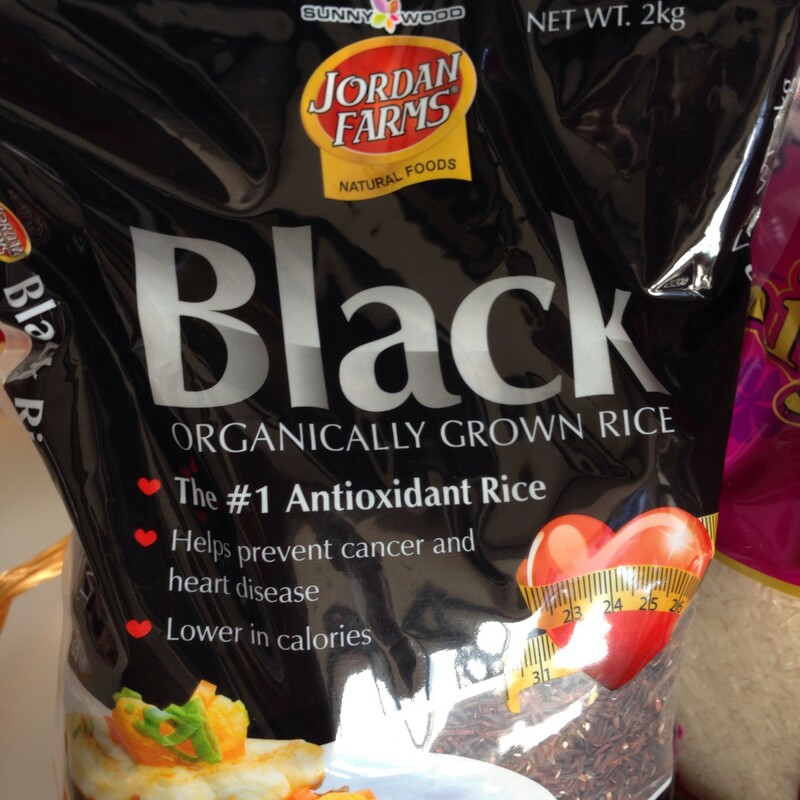 Rice is pretty much a staple in all our meals and we usually mix white with multi-grain, red, or black organically grown rice. What’s a hearty breakfast in your home? I need more ideas! Hi Joy! 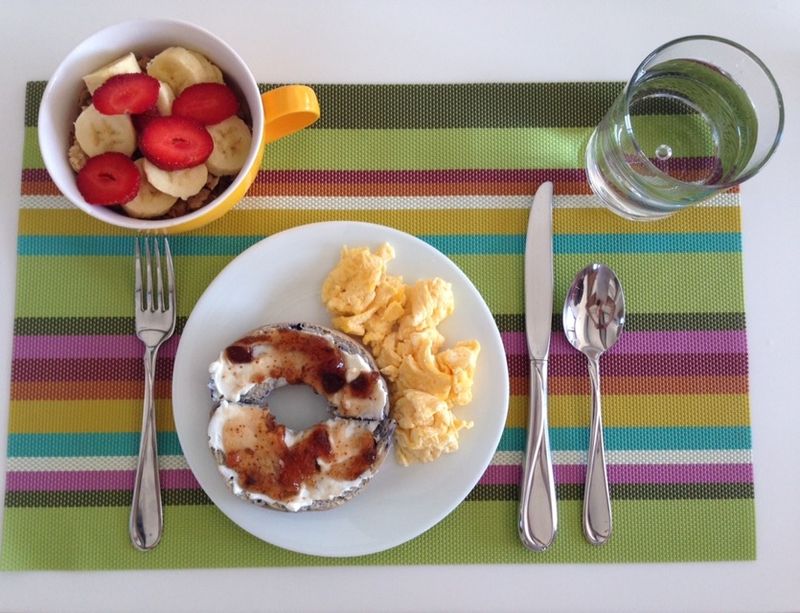 I really enjoyed these pictures of the scrumptious home style breakfasts your family loves. You asked for recommendations on pancakes. I would suggest making them from scratch. I have found some easy recipes with readily available ingredients on Google. You can make them healthier by using substitutes such as unsweetened applesauce for oil or butter and a combination of whole wheat, regular flour, and wheat germ (1:1:1 ratio) for added fiber and lower glycemic index. The taste and texture will be different but can be gotten used to. I have added mashed bananas and chocolate chips to my pancakes whenever my girls ask for them. Hope you will give it a try! Homemade skinless longanissa with egg and garlic rice, eggs Benedict with choice of smoked salmon, back bacon or spinach and tomato, add some hash browns. French toast with maple syrup. My family’s favorite . . . crepes with fresh mango and whipped cream. Since we don’t have househelp, they don’t get this too often 🙂 Usually on Saturdays when we’re not rushing quite so much to get ready in the morning. Thanks for sharing your breakfast meals. Admittedly, it is the hardest meal to plan, considering that we’re surrounded with instant, canned and preserved breakfast foods. 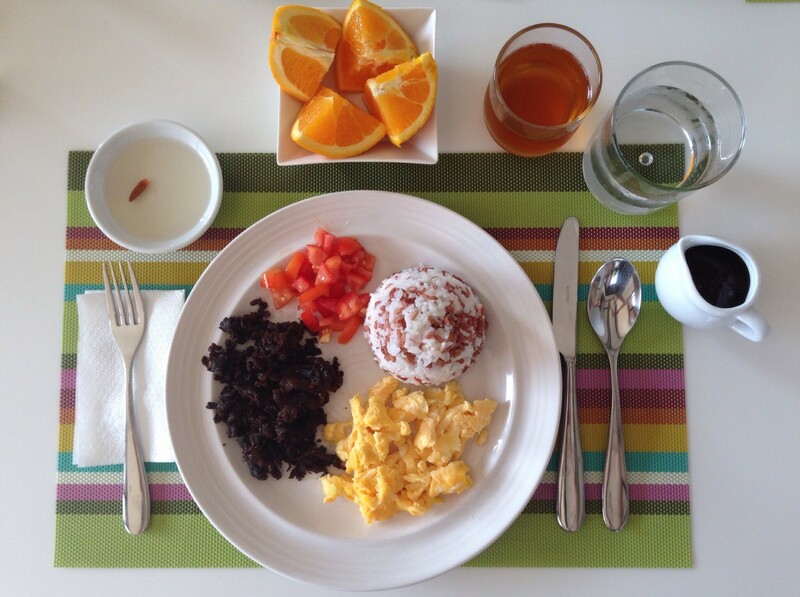 God bless you with more healthy breakfast meals to share! The photos itself nakakabusog na… Bona Pettit ! Thank you! So thoughtful of you! 2. Overnight-soaked oats (soak rolled oats in milk of choice. You can add other healthy stuff like chia seeds, ground flax seeds, fruits, peanut butter, cacao nibs, etc. ), with cheese omelette. 3. Open-faced tuna sandwich (cook tuna with garlic, onions, mushrooms, basil, olive oil) on wheat bread, scrambled egg, green smoothie (plenty of spinach or other types of greens, banana, apple, almond milk, ice). 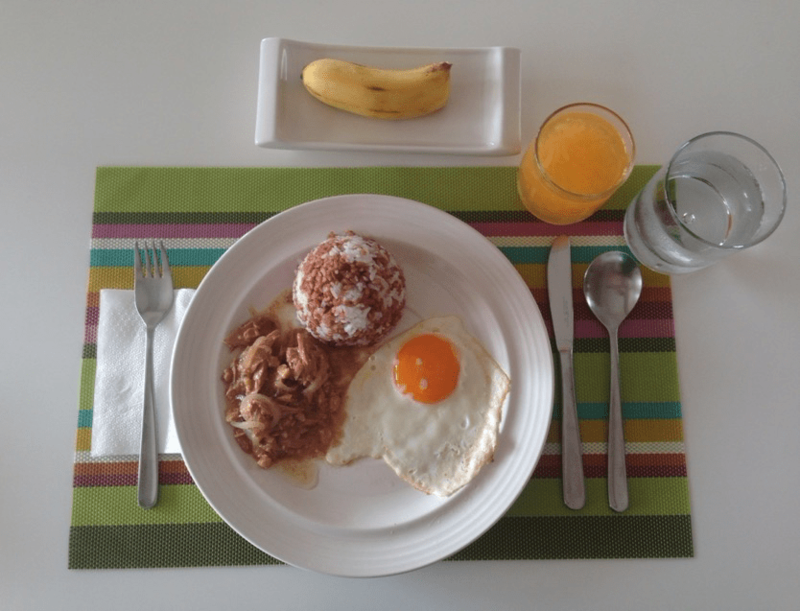 My husband and I also try to vary our breakfast but it’s usually the merienda for us that kind of stands out – the reason being I am awake and I have the energy to create a meal. 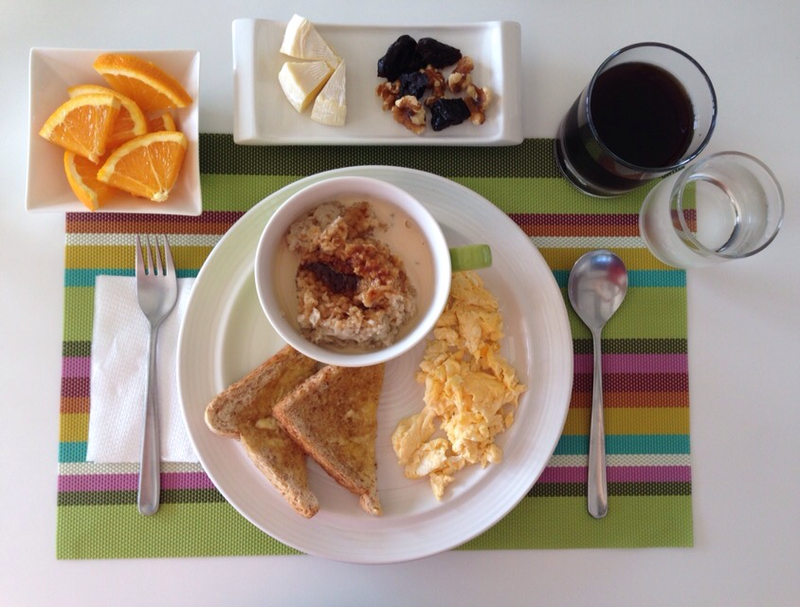 Great suggestions and will definitely keep that in my “go-to” breakfast meals! 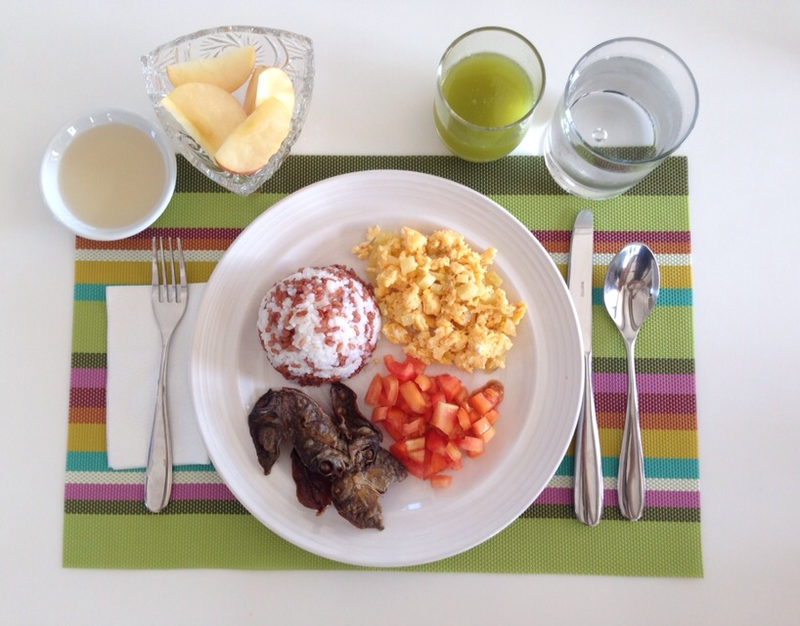 Hi Joy thank you so much for sharing your brilliant, yummy and hearty breakfast meals for your family. This blessed me a lot and pulled me back again to once again become intentional in preparing healthy breakfast for my husband and daughter. We live here in US and I can say that pancakes are much easier and yummier to be made from scratch. Our recipe are: 1 cup of flour (I used White Lily self-rising flour, good for all of my baking needs plus it has a smooth texture), 1/2 cup sugar, a cup of whole milk (rich with vitamin D), 1 fresh egg and 2 tbsp. of butter. Mix it all together and you see will see how easy and yummier it can be to serve for your wonderful & hearty appetite familyfamily. I love this! At least now I have an idea what to give your family – will have breakfast in mind. Hehehe. We don’t eat much of breakfast in my home. Everyone is out early for school, but when I do get a chance, I usually have the standard @itsjudytime (that family vlog I watch in youtube) fave – soysauce fried rice, a sunny side up, avocado slices and cherry tomatoes. I sprinkle a little pepper and it is gooooooodddd!!! Maybe you can up your game with power smoothies? try Salted Egg 🙂 they make the best salted egg in pampanga. Hi Joy! I’m just wondering how do you decide for the portion and combination of your breakfast. and did you cook the white and black rice separately and mixed together once cooked or they can cook together in a rice cooker? 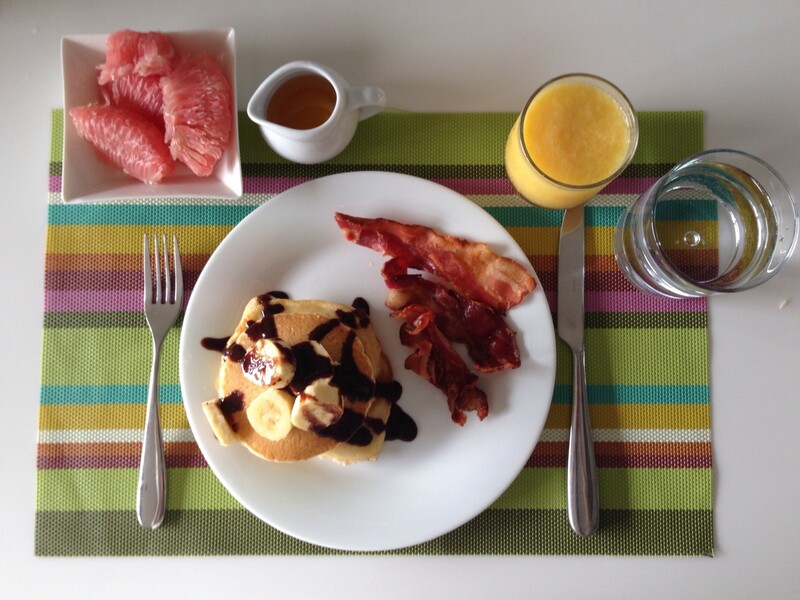 Healthier Pancake Option – Banana Oatmeal Pancakes! This post made me hungry!! Ok! :) Actually I need to improve on and update this post! Egg ‘McMuffin’ with toasted English muffin, egg, cheese and ham. You can even wrap it up in wax or parchment paper with pan fried potatoes (hashbrown) on the side and ketchup too. Better than the fast food version!